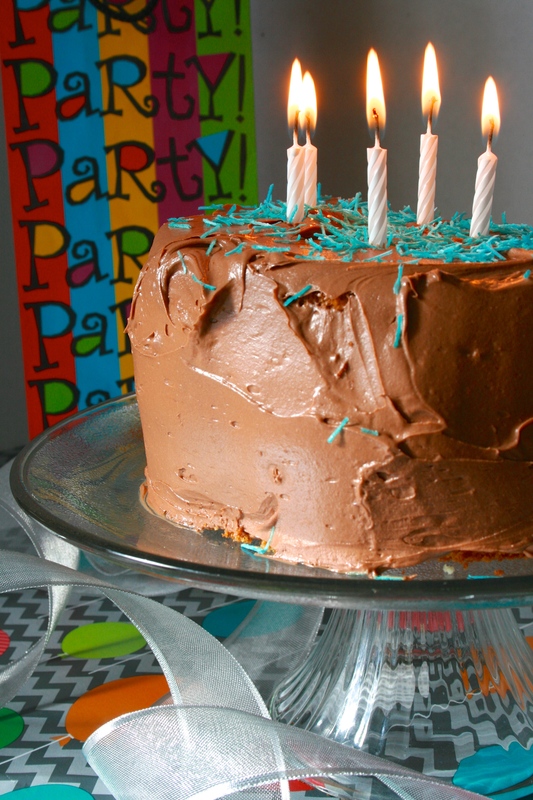 The best chocolate frosting. Ever. Silky, smooth, and really chocolaty. 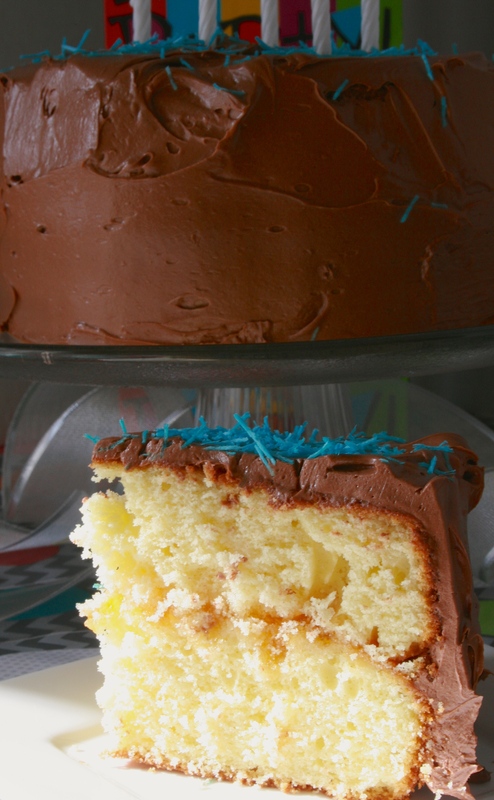 The yellow cake is the best yellow cake ever. Soft, fluffy, and yellow. Preheat the oven to 350F and grease two round cake pans. In a measuring cup lightly whisk the yolks, 1/4 cup milk, and vanilla. Add the butter and the remaining 3/4 cup milk. Mix on low speed until the dry ingredients are moistened. Increase to medium speed and beat for 1 and 1/2 minutes. Scrape down the sides. Gradually add the egg mixture in 3 batches, beating for 20 seconds after each addition to incorporate the ingredients and strengthen the structure. Scrape down the sides. Scrape the batter into the prepared pans and smooth the surface with a spatula. Bake 25 to 35 minutes or until a toothpick inserted near the center comes out clean. The cakes should start to shrink from the sides of the pans only after removal from the oven. Let the cakes cool in the pan on racks for 10 minutes. Loosen the sides with a small metal spatula and invert onto greased wire racks. Beat the butter and sugar together, on medium-high, for at least 5 minutes. Beat in the vanilla and salt. Pour in the melted chocolate and beat, scraping down the sides, until fully combined. This is just a classic!! So pretty! This cake looks so light and moist! I’m definitely keeping this one, and you have decorated it so pretty. i was craving this exact kind of cake earlier this week so I’m so happy you posted this recipe. I’m practically drooling looking at these pictures.